Villathis property is a characteristic and welcoming apartment. It sleeps three people. From Villathis property you will enjoy a pleasant view of the garden. Villathis property is 40 square meters (430 square feet). It features a shared swimming pool, a shared garden, a reserved outdoor area and winter heating. Villathis property is located on the ground floor of a three story building. You will reach it from the parking area along a short walkway that cuts through the garden. 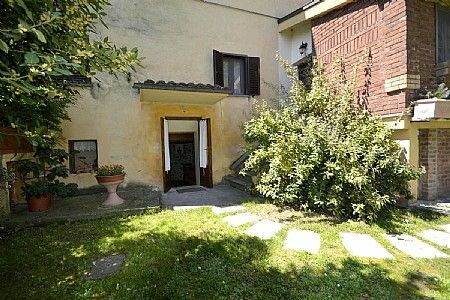 Villathis propertypartments are part of a typical Tuscan style complex, consisting of 5 apartments, which is located in the heart of the Valdichiana, near the state highway that takes toward the center of Castiglion Fiorentino. In the garden there will be a reserved area for your own exclusive use. The garden is equipped with a table and chairs. You will be able to enter the living room from the garden going down three steps. The ceiling has characteristic exposed wood beams. The furnishings are warm and welcoming. The furnishings include a divan bed for one guest. There is a nice fireplace made of stone. In the living room you will also find a cooking area. The kitchenette is equipped with a four-burner gas cooker, a small refrigerator with freezer and an Italian-style coffee-maker. The dining table can accommodate three guests. In this room you will find a television (local channels). From the living room you will be able to enter the garden through a double-glazed French door. The room has a double-glazed window. You will be able to enter the bedroom from the living room. The bedroom has a matrimonial bed (160 cm/62 inches, wider than a queen-size bed). The room has a double-glazed small window overlooking the patio of the adjacent apartment. The villa offers superb accommodation, including modern luxuries such as a community pool and a television.